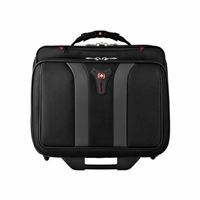 From the maker of the Genuine Swiss Army Knife, the sleek GRANADA is a modern interpretation of the wheeled case that will protect up to a 17" widescreen laptop and hold all of your belongings without weighing you down. A spacious overnight compartment stores a change of clothes for a the next day and the easy-glide skate wheels and locking telescopic handle make maneuvering narrow aisles and tight corners a cinch. 17" x 16.5" x 10"